How to photograph artificial poppies on and around Remembrance Day. Remembrance Sunday is a day that commemorates the sacrifices of armed forces and civilians in times of war and artificial poppies are bought and worn as a mark of respect. Although the 11th is the actual Remembrance Day, a two-minute silence is observed at war memorials and other public spaces across the UK at 11am on Remembrance Sunday. At these locations and for weeks after you will see decorative wreaths of poppies placed at these memorials which can make an interesting subject for photographers. Any compact camera can be used to photograph memorials and artificial poppies. As long as it has a lens with a fairly close focus you will be able to shoot closer shots of individual poppies or wreaths, and a wide angle will help you take a more overall view of the scene. The main thing you need is imagination. At all times respect the location. These are areas marked for people who lost their lives and people come to pay their respects. The last thing they want is a disrespectful photographer interrupting their moment. Memorials are often grand structures and dwarf the wreaths placed below them so consider moving in closer with a tighter crop of the scene. Use a wide angle and move in close placing the memorial to one side and allow the background scenery / cityscape to contrast against the scene. Consider the bright colour of the poppies against the often cold dark tones of the memorial and underexpose slightly so the darker areas become a stark contrast behind the vibrant red of the poppies. You can adjust the contrast and colour saturation using your image editing program to enhance the poppy colour. Try focusing on a single poppy and isolate it from the rest of the scene. Placing one strategically on a part of the memorial will give an interesting still life set. Use a polarising filter to prevent reflections from the statue or polished marble. Home in on a single poppy in a wreath and use a wide aperture to throw the rest out of focus. Choose the right angle and the rest will be a blur of red as a background. Many of the memorials have very poignant messages engraved in the marble. Try including one of these in the shot with a wreath. Have the wreath on the foreground and the message tailing off to the distance. Photography the message head on and cropped so just a few of the words are visible with a single poppy laid over them. Candid shots of old war veterans wearing poppies can make good photographs. Again, respect the person. Asking if you can take a photograph is polite and then you don't have to grab the moment. You can spend a few minutes composing the shot and making sure the viewpoint is good. If the person is in a wheel chair get down to their level for a better perspective. 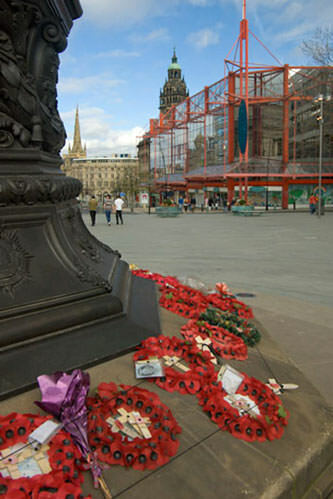 A photo of a person placing a poppy on the memorial could look good from the right angle. Again, take from a low viewpoint and makes sure the face and the poppy are in frame.